A new Taub Center study presents a concerning picture of long-term care and poses the challenging question: how can the healthcare system prepare to cope with these inevitable demographic changes? The share of Israelis aged 70 and older is projected to double in the coming decades, and the needs for long-term care among this generation will increase accordingly. A new Taub Center study presents a concerning picture of long-term care and poses the challenging question: how can the healthcare system prepare to cope with these inevitable demographic changes? 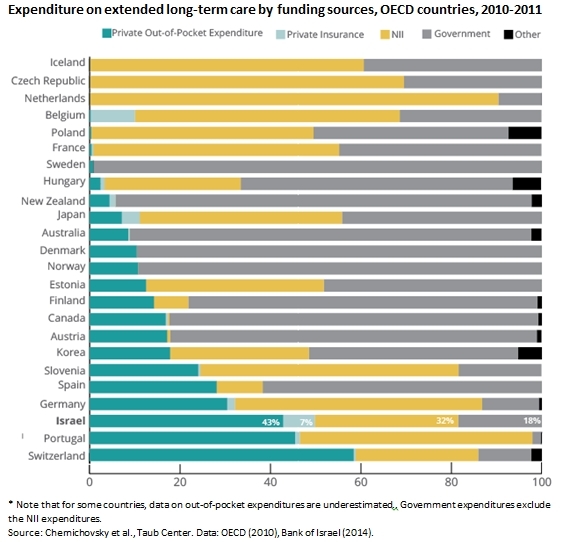 According to the study, the first one comparing Israel and the OECD on this topic, Israel’s long-term care system is unequitable and inefficient, and the share of private funding in Israel is three times higher than the OECD average. The authors offer several potential solutions for restructuring long-term care, including the option of defining long-term care, which is not solely for the elderly, as part of a universal basket of coverage that is protected by law and managed by a designated authority. 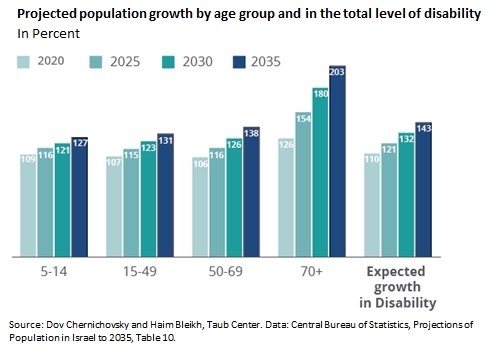 Israel’s population is expected to age substantially in the coming decades. The share of elderly in the population, particularly those aged 75 and older, is expected to double from about 610,000 today to about 1.24 million by 2035, while the rest of the population is projected to grow by about 31%. Consequently, the disability level, which is by nature higher among the elderly, is expected to grow by 43%, a growth rate that is 16% faster than that of the general population during this time period. While the increased life expectancy among Israelis is a welcome development, it requires better preparation for the growing health needs of those who are living longer. Illness and functional impairment drive a growing need for in-home care, and in more severe cases, inpatient nursing homes. The changing ratio between the age groups – more of those aged 70 and older compared to those aged 15-69 – is expected to exacerbate the challenges related to caring for one’s parents and increase the burden on Israeli households. The new Taub Center study by Prof. Dov Chernichovsky, Prof. Avigdor Kaplan, Eitan Regev, and Prof. Yochanan Shtessman examines the issues of funding and organization in long-term care. In addition, the study compares the long-term care system in Israel to those in OECD countries for the first time. Based on these comparisons and the experiences of other countries, the researchers propose potential solutions to regulating the market for long-term care in Israel. The long-term care system in Israel faces a number of challenges, including a lack of sufficient coverage for the entire population, funding issues, a multitude of authorities responsible for matters related to long-term care, and a lack of preparedness for the future. The Taub Center study shows that Israel’s total national expenditure on long-term care – including community care, institutional care, and premiums on long-term care insurance – is estimated at NIS 15.3 billion in 2014, and the government covers about half, or NIS 8.3 billion, of this expenditure. • The National Insurance Institute covers funding and subsidies for in-home nursing care for about 160,000 elderly Israelis at a cost of NIS 5.31 billion, about 64% of total public funding in this realm. • The Ministry of Health and the Ministry of Social Services fund assisted living facilities for about 14,000 of Israel’s elderly. These cost around NIS 2.1 billion, representing about 26% of public funding for long-term care. • Through kupot holim (health funds), the state finances complex nursing care (for those with both complex medical problems and long-term care needs) for about 1,600 elderly Israelis, costing NIS 891 million and representing some 10% of public funding for long-term care. The fragmentation of responsibilities between the different ministries leads to inefficiency and hurts the continuity of care. Most importantly, this leads to suffering among elderly Israelis and their families. Furthermore, the right to institutional care is not universal and is means-tested. This financial structure leaves behind middle class households who are not poor enough to qualify for financial assistance for long-term care, but are not wealthy enough to afford privately funded assisted living facilities. The Taub Center study shows that household expenditures on long-term care are divided among a number of different areas: payment to employ caregivers (often foreign workers), which costs about NIS 2.6 billion per year (about 39% of private spending on long-term care) and assisted living, which costs NIS 2.5 billion (about 37% of private spending). The remaining NIS 1.6 billion in private spending, which represents some 22% of total private expenditures on long-term care, goes toward insurance premiums. In considering these expenses, it is important to note the lack of clarity in the number of people covered by long-term care insurance. As of 2014, according to estimates by the Insurance Commissioner, 5.31 million people had long-term care insurance in Israel, including both individual and group plans. However, according to the Central Bureau of Statistics’ Family Expenditure Survey, the rate of those covered by long-term care insurance is much lower. It appears that the gap between the two estimates stems from underreporting and a lack of awareness of insurance policies that are available through both the health funds and workplaces. Regardless, not all Israelis have access to long-term care coverage. Extensive reliance on private funding combined with the sharp increase in the anticipated need will exacerbate the issue of care for family members and increase the burden on Israeli households. The Taub Center research presents, for the first time, Israel’s long-term care situation as compared to OECD countries. The researchers suggest that, in terms of spending on long-term care relative to GDP, Israel falls near the Nordic countries (about 1.4% of GDP) – but these countries have introduced universal long-term care insurance while Israel has introduced no such coverage. Conversely, Israel’s expenditure level is higher than countries like Australia or Germany, where the long-term care system is similar to that of Israel’s. Israel’s expenditure is particularly high considering that its elderly population is smaller (as a share of the total population) than that of the other countries assessed. As such, the international comparison shows that Israel is not effectively distributing or providing care given the resources it allocates. Another prominent characteristic in Israel’s long-term care system is that the share of private expenditure on care is nearly 45%, almost triple that of the OECD, which stands at 16% on average. The study also shows that Israel stands out in the share of care for patients aged 65 and older that is provided in the community: about 19% versus 9% for the OECD countries for which data is available. This figure may indicate a greater commitment to caring for Israel’s elderly in the community, but it could also reflect the relatively limited options and access to institutional care available in the country. In such situations, a large amount of the burden falls on families to fund care independently – whether by paying for care provided by foreign workers or by missing work days to care for their elderly family members. This extensive reliance on households furthers inequality between families at different income levels: households that are unable to afford long-term care at home or in assisted living facilities must bear the burden on their own. As part of its international comparison, the Taub Center study examined long-term care solutions in place around the world. The data show that nearly all countries with social service funding structures similar to Israel’s chose publicly-oriented solutions, combining compulsory insurance payments with public funding and thereby enabling the existence of an efficient and equitable universal long-term care system. Taub Center researchers found that the Ministry of Finance and Ministry of Health proposals do not sufficiently address the primary problems associated with long-term care in Israel. The Ministry of Finance’s approach, which seeks to further privatize long-term care, has not proven effective in other parts of the world. The funding available through a private insurance system is relatively limited, as low-income earners cannot afford the premiums and high-income earners often prefer to make other arrangements, such as paying for in-home care. Additionally, private insurance premiums are relatively high due to the high risk associated with accurately projecting the growth of the population and anticipating its long-term needs. Young people do not tend to purchase long-term care insurance. A system that would require young adults to be insured would prevent them from living without care in their old age, while simultaneously enlarging the funding sources for the care of the older generation. • Including long-term care in the universal basic healthcare basket. • Financing: the basic basket could be funded through existing public sources in addition to a mandatory fee collected from all Israeli citizens. Given the expanded life expectancy of Israelis, raising the retirement age presents another opportunity for funding. At the same time, given the high cost of long-term care and increased needs, Israel may need to maintain income tests for certain entitlements, as is done in a number of OECD countries. • Private insurance: supplementary long-term care insurance may be made available alongside universal care. • Establishment of a single, dedicated authority: the responsibility for all long-term care management could be designated to a single authority. The authority would provide long-term care services offered by independent providers and medical services through the health funds, as is the norm today. The authority could ensure continuity of care and that the system operates more equitably and efficiently than it does today. The Taub Center for Social Policy Studies in Israel is an independent, non-partisan socioeconomic research institute. The Center provides decision makers and the public with research and findings on some of the most critical issues facing Israel in the areas of education, health, welfare, labor markets and economic policy in order to impact the decision-making process in Israel and to advance the well-being of all Israelis.